Discussion in 'Retail Refillers Forum' started by jakm4n, Aug 11, 2008. Is there any other solution out there that I can make or last resort buy a premade solution? you can add 3 drops of concentrated ammonia per 100 ml if you want a greater cleaning power. Is one of these better than the other .. glycerine or propylene glycol? Which do you prefer out of these two? Do you can any proper measurements? I find propylene glycol slightly better, because it is less viscous. Isopropanol = isopropyl alcohol is superior to potable alcohol. But potable alcohol can be used as a second choice alternative. You can make 1 liter of it. This much easier to measure than small amounts. The solution can be kept almost eternally if kept in a cool and dark place. It does not need any preservative since the amount of alcohol is above 18 %. 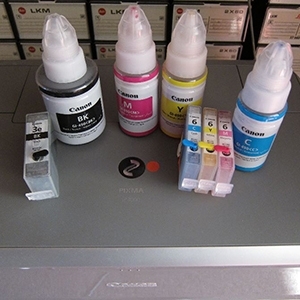 The above solution has the advantage that after drying the sponge (water + alcohol (+ ammonia) will evaporate) is slightly humected with propylene glycol: this will enhance the penetration degree of your ink into the sponges, without changing your ink significantly. What would be a good source for propylene glycol in the US? propylene glycol and glycerine can be obtained at your local drugstore. It is used as a humectant in creams and a additive in cough syrups. However I don't know the local legislation about buying these chemicals, since it is quite strict nowadays in the USA. It is quite harmless, since it is potable and not-toxic. Thanks for the help Pharmacist. I did not know Propylene Glycol was used in so many things. I'm happy to be able to prepare "The Pharmacist" solution to clean up my Cartridge this week end. pharmacist, The Hat and Tudor like this. I have used @pharmacist solution on several of my cartridges that would not give consistent ink flow and it worked like a charm, it also works great when you let the sponge dry out completely..